November | 2004 | Abez sez Assalamualaikum! I have no idea what time we woke up… I think it was 10:00? In either case, we made a phone call to Ushiville to book a later appointment and found they were free to play immediately. So Hemmie dropped us off on her way to class and we had a lovely time reminiscing and rather unexpectedly watching a good twenty minutes of Ma Shakti. Ah, good times. It turns out that Ushi & Co. are actually connected with Hemmie and Co., and it’s first degree too! Hemmie went to school with Maichoo, and Maichoo knows and remembers Hemmie Bro too. As Hemmie and Maichoo sat comparing notes on who was now married to whom or working for what company, I felt I could finally relate to Chai who complains that we’ve moved in on her family. It’s true, she has an awesome family. We can’t help but do things like say… drive up to Lahore and visit her cousins without her, he he. After coming back home to Hemmie-ville it was time for a power nap, and by power nap I mean one mighty powerful nap where I closed my eyes and opened them instantly two hours later. By then Chij, Niqabified and Sister S. were on their way and I had about half an hour to look presentable. Which I wasted entirely, so I met them in the same jilbab I had spent the day in. To be fair, I did bring a somewhat nice looking shalwar qameez to Lahore for the express purpose of pretending to be a decently-dressed person. I wasn’t trying to impress Hemmie (too late, she’s seen my clothes, both of them) but Chij, Niqabified & Sister S., meeting them for the first time I should have been better dressed. Should have. But wasn’t. The shalwar qameez I brought never saw use. This was because we were either out of the house (jilbab) or asleep (pajamas.) Yes folks, it was that much fun. After a rocking good time with Chij & Co. and chocolate cupcakes I couldn’t eat, we drove them home to an area of Lahore that Hemmie was unfamiliar with. Getting lost seemed like an adventuresome prospect, but unfortunately Hemmie found her way back to the road and we got home again. At about 11 o’clock we decided to zoom by food street. I could tell you how it went, but I’ll let Hemmie tell you. To be fair, Lahoris don’t stare more than Karachites do, but they can both be equally bad. At one point it was infuriating, now it’s just irritating, and since I’m fulfilling my responsibility of being fully dressed, I’m pretty sure the na-jaiz fun of staring at me is comparable to the excitement of staring at six and a half yards of black georgette- one and a half for the scarf, five for the jilb. We did eventually get to bed. Hemmie we packed off around 1:30 am, Owlie and I were up until about 4 am, allowing for about 2 hours of sleep before it was time to zoom back to Isloo the next morn. Over-stimulation can do that to a body. Today: You know how sometimes you love something so much you want to squeeze the person who gave it to you to the point where their ribs crack, but refrain because you don’t want to hurt them or freak them out? This would be one of those times. I have Chai back. And she is the reason why I’m sitting here in fleece pajamas and a blue robe with yellow duckies on it. I wish the digicam were working. The whole world needs to see these. I believe that joy should be shared. Baji is the expert travelogue writer, not Abez, and with that disclaimer out of the way, here’s the Lahore Weekend Log! Saturday: We were supposed to be on the motorway by 2pm, but it was actually closer to 3pm by the time we got ourselves out of the house. Having gotten onto the motorway, we were supposed to have maintained a speed of about 120kmh, but no one told our car this, and it protested by shaking so hard it sounded like it was going to fall into tiny pieces (Suzuki, by Mattel). So what would normally have been a four hour drive was actually six, and by the time we got to Lahore and called Hemmie from the Daewoo station, we had sufficiently worried her for me to get scolded, hehe. After we got to Hemmie’s house we were dined & dined (not wined, just deliciously over-fed, hehe) on Nihari and Aloo Gobi and chicken in black pepper and Saag which was really, really good. Then for some reason we went to Hot Spot (or is it Hot Shots? Can never remember…) for desert. At midnight it was packed, which could either say a lot about their deserts or a little about how bored Lahoris are, but I’ll leave the conclusion up to you because other Hemmie might vanquish me, he he. But yes, for whatever reason, the place was packed, and I should have had the sense to realize that I was not unseen and unheard as a happily slid into the booth with a very audible ‘woosh!,’ and hands in the air. Sleep deprivation is a funny thing. Realizing what I had done, I looked around. The people in the nearby booths were busy with their ice-cream. No prob there, but the people on the other side of the huge glass window were highly amused. I had a small audience in the parking lot. I picked my purse up and found a table downstairs. There was no one else there. Demi-Hemmie (the lil sister) had a peach sorbet and Hemmie had a little of what everyone else was having, which is brilliant because the deserts are too big anyway. I had strawberry frozen yogurt and Owlie nearly killed herself trying to finish a piece of cheesecake by herself. I would have helped her, honest, but I’m being a good patient and cheese is on the list of ‘Abez’s favorite things that the Tabib has forbidden.’ There are other things on the list that I simply forgot about though. I spent the weekend drinking contraband pop. Or soft-drinks as non-Chicagoans say. This is soft drinks as compared to hard drinks, like vodka, which aren’t on the do-not-consume list, but hey, I think I’ll pass anyway. Chocolate and nuts were on the list too, but I honestly forgot and had a mini-Snickers. I’m going to blame Owlie for this because she realized I was eating forbidden fruit but didn’t say anything. She wanted to see what would happen and has actually been taking bets on how long it would take me to break my parhaizi. (parhaizi: Tabib sez no good eats) It’s not cruel of her, it’s just realistic. I get gastroenteritis from eating stuff like pani poori and limka from thela-walas in the summer, and in addition to the usual course of antibiotics, the Tabib always tells me that I’m not allowed to have anything but yogurt, white rice and bananas. I go home and try. I get bored after one meal and move on to lasagna. Parhaizi is hard for me. We also got a whirlwind tour of LUMS, complete with a visit to Hemmie’s dorm to find her pajamas and meet her room mate, who looked rather like a pile of blue comforters. I think it was about 1:30 am. I don’t blame her, I was jealous to not be a big pile of happily snoring blankets myself. Back to Hemmie-land, we laughed and guffawed over old pictures and made merciless fun of each other in the way that only real friends can. Dear Lord… you were fat. And you looked like a desiccated mouse. I don’t know what time we eventually got to bed. It was all a happy blur. Tomorrow: Hum Hay Blogistani; Hanging with Ushi & Co., meeting Chij & Niqabified & Chij’s sister. – Leaving for Lahore and Hemmie and Chij and good times in fifteen minutes. – With Crayon and Chai on my mind. This morning I saw Tabib #2 about my badly-behaved head. He said (after the mandatory toothpick) that he thought I was having varient migraines. Then he starting naming things like mint and chocolate and coffee and cheese and I became overjoyed in the false hope that he was giving me a prescription but Alas! he was telling me what I must not eat. I don’t know if I’m convinced of the diagnosis so much as I just want to be convinced of it. Either way, I’ll be a good and dutiful patient for a week before going back to Tabib #2 and I hope InshaAllah that parhaizi (Urdu word meaning: no good eats) will be enough to fix things. Gots to go bake stuff. Abezistan is descending upon Lahore this weekend and this calls for cookies. Well, now that blogger is finally letting me in I can type an update. It’s 4am and I’m still not asleep. This is irony when you consider that half an hour ago when I asked Owlie to turn the lights off she said, “But I’m not sleepy!” and I said, “But I am, come on, I need to wake up in the morning.” So she finally gave in and turned the lights off. And now she’s fast asleep and I’m blogging in the dark. 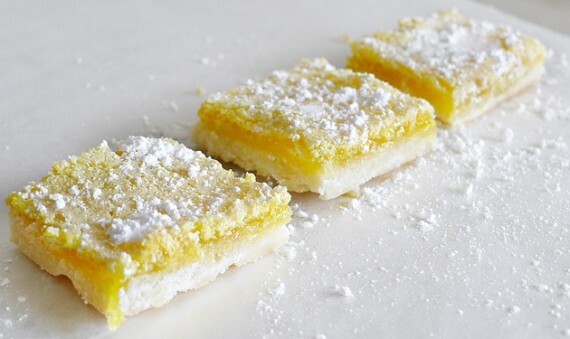 This is what lemon squares look like. When they’re not being eaten like cereal. I can remember, when I was little, sitting in on a Sunday School class in my mother’s church and being amused at how they prayed; the churchgoers were seated on folding metal chairs that were arranged in a loose semi-circle. Some of them were half-way turned around for people who had been sharing their Bibles and needed to face another person. When it came time to pray, all of these people facing all different ways folded their arms over their stomachs and bowed their heads. It looked half-way between a traffic jam and a communal stomach-ache. I suppose that Muslim prayer must look as unusual to a Christian as a Christian prayer looked unusual to me, but the direction we face does have a purpose. We’re praying to God and we face the Kabah as a point of unity. No matter what kind of Muslim you are, no matter where in the world you pray, you and millions of others are facing the same direction. If our prayers shot out like bullets, they would go right past Australia and then circle around the world endlessly. The same would happen to the prayers of people in multi-story buildings because they were offered at the wrong altitude. That is, if our prayers were headed to some destination here on Earth. They’re not though, our prayers go to God regardless of our religious navigation skills. One simple example of this is the area around the Kabah itself where two or three balconies rise above it. At this altitude, the worshippers’ prayers miss the Kabah entirely, but fortunately, prayers don’t go forward, they go Superman. Up, up and away! Well, it’s 7 o’clock and there’s no food in the house. I don’t mean that there isn’t anything edible at all, I just mean that there’s nothing that would be appropriate for an meal. The fridge is full to bursting with things like sheer khurma, cake, dahi baray and various other crunchy-munchy snack foods and sweets that you serve for Eid. No food food though, nothing that I could fill a plate with and call dinner. I could just serve myself a little of everything and call it the variety platter, but considering that I already had sheer khurma for breakfast and a piece of cake for lunch, I think I’m ready for something like… spaghetti? Mmmm… Owlie, though, is not a big fan of spaghetti, unlike both myself and Sofia Loren who owe everything we are to pasta. Alright, so I’m hungry and there’s no real dinner. There wasn’t any yesterday either, and I made do on salad for breakfast, sweets for lunch and a bowl of jello at midnight. I think we’re all out of the habit of cooking. Mealtimes in Ramadan were 5:10 (tea, fruit and snacks) dinner at 7:30 (leftovers from Sehri) and Sehri at 4:30 (leftovers from Iftar). Never mind, I’ll just grin and type simultaneously. Got a lot to be happy about today, tomorrow is the culmination of a whole month’s worth of fasting. Am I happy because fasting is finished? No, I’m actually kind of wishing this Ramadan hadn’t gone by so fast. I suppose I’m just happy because in a lovely and fitting wrap-up of this month’s devotion, Muslims will join together in a communal prayer seeking God’s mercy and the purification of their actions & intentions and forgiveness of their sins. This isn’t the end to what we’ve been working towards in Ramadan, it’s just the inauguration of the real-time application. Allah makes it easy for us in Ramadan so that we can build good habits and grow in ways that are harder to do without the benefit of a holy month, and starting tomorrow, it’s time to practice everything we’ve been errr… practicing. So now it’s time to reimmerse our spiritually refreshed and renewed selves back into the world of trial by fire and work to keep our cool all the way until the next Ramadan InshaAllah. This isn’t the end, it’s the just the beginning, baybee! Here’s an interesting quiz: can you translate these two paragraphs of Arabic? Wallahi Al-atfal yajroona fil mal’aab, yal’abu kurratl-qadam. Kuntu amshi izi dzhuribta rasi bil-kurati. Ok, so we all know a few words, right? Like Wallahi, that means ‘by God.’ Al-Ard, that means the earth, and we’ve spotted the word lail in the second paragraph which you know means night. The word Allah is in both of those paragraphs too. So any guesses on the meanings? If you’re like me then you might not have a very clear idea of what’s being stated above, and without a translation, you’re kind of lost actually. They could mean anything. Now, say you’ve been assigned to recite one of these paragraphs with every ounce of religious devotion you’ve got, but not knowing what you’re saying, how do you hope to really mean what you say? Having been raised in the US, my Arabic skills were nil until I came to Pakistan and started studying. Right now they’re half a degree up from nil, but even with my severely limited Arabic skills I have gained an understanding of the beauty of the Qur’an in its original form that I could never have gotten without being able to read the Arabic. Before that I could have recited Al-Baqra (The Cow, a chapter in the Qur’an referring to the golden calf worshipped by Prophet Moses’ followers in his absence) or a recipe for roasting beef and gotten the same understanding from it. It’s important for Muslims to learn Arabic, not because Islam is an Arab religion, but because the Qur’an just happens to be in Arabic. 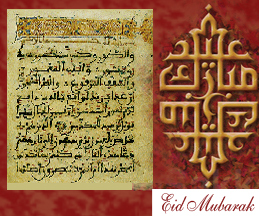 God states in the Qur’an that He revealed the same Message to different people at different times in different languages, and Arabic just happens to be the language of the current revelation. Without the power to understand the Qur’an on our own we’re always going to be left with our attention wandering during prayers when the Imam recites a verse that we haven’t already memorized the translation to. Or at best, we stand in confused devotion trying to guess at the meaning and obtain guidance from a recitation that (without translation) is nothing more than a pleasant sound in our ears. The first of those paragraphs though, is not only NOT divine, it’s also a badly written selection from my Arabic homework. Anyone wanna guess at the meaning? I come in just after the news (4min) and am around till they tell me bye-bye. (23 min) And in the middle there’s actually a caller from Kalamazoo. And I thought Islamabad was an exotic location, hmmph! And uh… some of you may figure out that they’re not calling me Abez. I know this might be hard to swallow, but uh…Abez is my real name. That other one? That’s the name I tell other people to protect my secret superhero identity. You know, just like Superman goes around telling people his name is Clark Kent even though his real name is really and truly Superman. Yep. How dare you blame my Lord for the evil of your sin! I (personally) suffer from parenthetical thought. That’s where you have distracting thoughts within other (otherwise perfectly straightforward) thoughts that can distract from your initial point. They don’t (necessarily) have to be negative though. Parenthetical thoughts can actually be used to help supplement your concentration in prayer. I’m sharing this because I sometimes suffer from poor concentration when I’m trying to pray. “I offer, the _________ prayer (name of a particular prayer), of ______ rakats (number of rakats), Qurbatan E-lal-Ah, (seeking nearness to Allah, in obedience to Him”). “I offer, (standing in a private audience with my Creator) the Maghrib prayer of 3 rakats seeking nearness to Allah (who raised the sky without pillars, hung it with stars and sprinkled tiny and lovely sparrows therein) in obedience to (and awe of) Him. I’m a big fan of sparrows. To me they are energetic, tiny, airborne ping-pong balls who stand (and fly, and bathe in dust, and play with each other and chirp happily) as proof of God’s love for all of His creations. God takes care of the need of all His creatures, even the sparrow. I offer, the Maghrib prayer of 3 rakats seeking nearness to Allah (in whose Hands are my life and soul, who I beseech for strong faith and good health) in obedience (and humble recognition of my own powerlessness over my own health) to Him. Subhana Rabbi yal A’la, which means Glory to my Lord, Most High. Wherever you set foot, we prostrate ourselves like earth. That we should see your Creation and neglect to see You? The world is like a monastery and He is my Guide. Seek that Existence which looks like non-existence! There is neither Islam nor Disbelief in this place. Imagine my surprise when the doorbell rang around 10 pm and when I went to answer it, I found Poppie on the other side of the gate. My surprise is very toothy, and it looks like the kind of grin on a three-year old discovering mud pies for the first time. It was a blogging hit & run, we had a whirlwind meet & greet in the dirty, post-Iftar party mess of my house late at night while Poppie’s family waited outside in the car. Poppie was quickly hugged, plied with cookies, hugged again and sent on her way. By this time tomorrow she’ll be back home in England. I’m slightly delayed in updating because I’m thinking thoughts. Maybe not thinking so much as sorting, here’s what I have. -Day one off of medication was fine. A few jabs in the ear but I made a point to relax and breathe and ignore it. Alhamdulillah, no problema. – Day Two: Better than day one, no pain. All good. Smooth sailing. Until Abez becomes severely but quietly mad about something and within an hour develops what feels like a blow to the right side of the head and throat. Bang! – Day Three: (today) Woke up and felt fine. No pain, but within ten minutes of waking up I was again faced with what had made me mad the day before, and my ear/face/head (right side as usual) have hurt all day since. It’s 11:55 pm right now. Mind over Body, Body vs. Mind? Everything happens for a reason, bi-Iznillah, and I find it an interesting coincidence that at the zenith of my anger and headache an interesting documentary came BBC World about the effect of stress on the human body. Living on stress is the equivalent of pushing the brake and the accelerator at the same time, and although you can mentally adjust yourself to it, that doesn’t stop you from damaging the engine. The extent of the engine damage varies from one person to another, and basically there are a whole slew of things that stress can do to you simply based on the fact that it’s too much for your body to be running on ‘ARGH!’ mode all the time. And I don’t mean the mind is in a state of Argh, it’s the body that’s in a state of Argh, doing all sorts of slowly deteriorating damage. Could this directly account for me having a head-ache on the right side of my head? I don’t know, because that’s not what a tension head-ache is, but the effects of living under stress for long periods of time do cause damage to the body over time. Although this may seem somewhat connected to what the neurologist said about me seeing a psychiatrist, it actually isn’t. The gist of what he said was: The pain’s all in your head, (imaginary) see a psychiatrist. The gist of what I’m considering is: Stress has taken its toll on my poor unsuspecting head. I’m willing to consider the stress theory because my second-rate stomach tried to digest itself (chronic gastritis) for the first time when Aniraz and I were living in Karachi away from the family, which was actually a very mentally taxing time. The second time the stomach tried to digest itself (the sequel, with a vengeance!) was the day after my engagement broke off. Ten months and hundreds of bottles of Gaviscon later my stomach is finally healed Alhamdulillah and I am happily indulging in the occasional nihari without consequence. I’m also drinking tea and coffee again (-zing-), something that was too painful to do when my stomach lining was inflamed. I was discussing this with, or rather, at Crayon, who’s a saint to let me talk her ear off on the phone, and she mentioned how this might be an effect of me not venting stress. Strange thing is, I never feel the need to vent. I don’t feel the need to shout or swear, I’m not holding anything back. And that doesn’t mean that I’m a saint and never say anything out of anger, it just means that certain comments can be equally barbed at conversational volume levels. If, even after taking chillaxation to the next level (I wanna take Tai-chi!) I’m still having one-sided headaches, then my Abbu basically insists that I head down to AKU and see another tabib, Insha’Allah. Am I averse to herbal medicine or alternative therapies? I don’t think so, but those are treatments, and a diagnosis would be nice too. 🙂 I need to know where I stand before I pick a direction to head in. Today has been a very hectic day. I woke up and went to the Tabib. To make a long story short, the Tabib has decided that although my pain has responded to the traditional treatment for trigeminal neuralgia, it was all in my head (ya’ani politely I’m nuts) and I should see a psychiatrist. That’s the abbreviated version. The unabbreviated version took twenty minutes and cost five hundred rupees. You don’t want that one. He told me that I have stress that I’m not telling him about and that I’m having tension headaches. Right. Tension headaches. In my teeth on the right side of my mouth. And my right eye. And in my right ear. But it still responds to both Neurontin and Topamax. I would like to have told el-Tabib that I have had my share of stress in life and that I deal with it through prayer, through writing, through raiding the bag of jelly beans in the deep freezer (oops, did I type that out loud?) but not by getting tense on one side of my face. It just doesn’t seem very me she said with an almondy sweetness faintly akin to cyanide. I developed the one-sided face-ache after a week-long fun-fest in Lahore, the great vacation that followed a vacation to the States before that, both of these set in six months of vacation where I haven’t been working this year. If I have stress, it must be the kind you get from having too much fun and too little hard work, and the over-exertion of enjoying yourself has to be interrupted by nice, long naps in between. Lest you hurt yourself. Or maybe even get a face-ache apparently. Maybe my ex-Tabib is used to dealing with people who suffer from what I call ‘creeping hypochondria,’ a mild disease that seems to migrate from one body part to another depending on what aches and how serious it could be and whose uncle had it once and had to have the leg cut off and Hai Allah mai margai! Someone get me an ambulance! Maybe I should’ve taken a whole slew of friends into the neurology ward to vouch for me: Abez is not a hypochondriac. Denial: Are you ok? You don’t look ok, you look all grouchy. Go away, I’m fine. Just leave me alone, my head hurts. Ok your head hurts, I’m sorry, but you don’t have to be so mean about it. Well you don’t have to be so annoying, just go away. I have a headache but I’m fine. How are you? Pretty good, what’s for lunch? So what’s the plan? Well, plan A. was to bonk ex-Tabib on the head with the rubber hammer that he bonked me with on the first visit to check my reflexes. Ah, irony. Plan B. was to poke him in the face with a toothpick a lot and ask if it hurt. Which he also did on the first visit, which would not only be irony, but would also be stress-relief. For me and my secret stress, he he. Ahem, ok, pardon me. Plan C: Refusal. (as compared to denial) I’m quitting Topamax cold turkey. The dose I missed was a few hours ago and aside from some twitching in the bridge of my nose (and the sudden hankering for a carrot?) I feel alright. Does my head hurt? Yes. But I refuse to be badly effected. I’m fine. I think I’m doing this to push the reset button. I’m going to start over with a new headache (or hopefully no headache) and go from there. If it’s too much to deal with (through prayer and jelly beans) then I’ll get a new Tabib. Who are you? Are you who you are inside? Or are you who you are outside? You are born with potential, with lovely and innocent potential to be sweet, to be caring, to be compassionate, perhaps a bit vulnerable even. But as you grow older and more hardened by life, you develop a harder exterior- A suit of armor to protect this vulnerable center. So the question is, who are you, the suit of armor of the cream filling? You thought I was going to be serious didn’t you? But hey it’s 3:45 am. So the joke’s on you, and you’re a suit of armor. You are to me anyway. You know why? Because to the people around you, it doesn’t matter what your cream filling is like because we never interact with it. We deal with your suit of armor instead, and to us, you are that suit. That armor is you, your personality to the world, and if your suit of armor has a nasty temper, it doesn’t matter whether the cream filling is sweet on the inside. That is why I believe personality tests are largely worthless if you take them as you’re supposed to. The reason is because the questions are being answered by the cream filling when it’s the suit of armor that’s interacting with the world instead. People don’t necessarily need analyses of their inner personality (cream filling) because no one knows their inner personalities better than they themselves do. You already know what flavor you are. I’ve decided that I’m Chocolate-Mint Mustard. What people might need is an analysis of their suit of armor, because you never know just how you look through other people’s eyes. I’d credit the band whose song I just stole the preceding line from, but their name is untypable. On with bweezness. If you really want to learn about yourself, pick out a really good personality test and then send it to five of your friends. See how they rate you. That’s you. Maybe not you on the inside, maybe not your cream filling, but you to the world is you in your deeds, and your deeds are a pretty good indicator of who you are, doncha think? The comment box yesterday was not the first place or time that someone has incredulously asked me whether my too-perfect family was for real. Incidentally, it’s also not the first time I’ve nearly died laughing. But I digress. In a round-about way I’ll get back to that, but first, a story. The wise man gestured towards the city and said, “You will find people the same therein.” The traveller turned on his heel and walked the other way. Man, I’ve gone off on a tangent. My family is neither perfect nor too good to be true, but I know from seeing other families that we have something that other families don’t always have: we have respect for each other, and we try to have patience. Overall, and above all, we have love. If you remember, if you keep in the back of your mind that you love your family members even when you’re angry with them, then the edge will be taken off of your anger and the irritation will never be honed into hate. It’s the hardest thing in the world, but try this: next time you’re in an argument, when you’re itching to say the meanest, nastiest, most hurtful thing you can think of, hold your tongue for five seconds. And then tell the other person that you love them. That, dear blogistan, is the effect of snow on fire.